What does CALPIRG stand for: The California Public Interest Research Group. What is CALPIRG? CALPIRG is a statewide, student-directed non-profit organization that works to solve problems facing our society, specifically by defending the public interest against powerful special interests. Our environment and public health are threatened, students are being ripped off, poverty is on the rise, and our decision makers aren’t listening to ordinary citizens. CALPIRG combines the idealism of students with the expertise of professional staff who work alongside students to do research, education, and grassroots organizing for the public. How is CALPIRG funded? CALPIRG is funded by tens of thousands of students at the UCs who pledge financially through student fees. 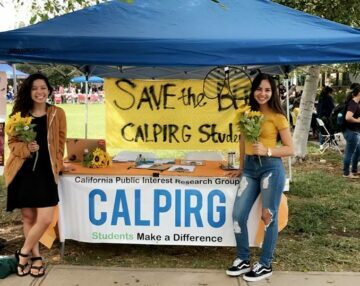 Students at the UCs have been a part of CALPIRG for 45 years, pooling together their resources statewide with other CALPIRG chapters to hire staff, such as researchers and grassroots organizers, to work with them on issues that they care about. How does CALPIRG spend the funding it receives? We spend the largest portion of our income on hiring professional staff – organizers, advocates and researchers – some work on campus and others work in Sacramento, the bay area, and DC full-time to fight for the issues that students care about and will benefit the public interest. We also spend a smaller portion on basic things it takes to run an organization – printing, phones, etc. Why does CALPIRG hire staff off campus? 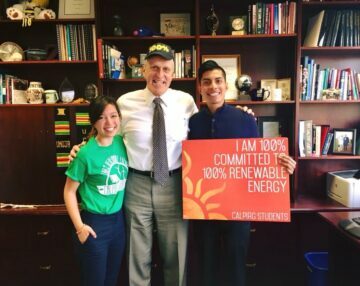 CALPIRG takes on problems that impact students and our community that extend beyond the borders of campus – like clean air, college affordability, health care. These are issues that impact students as students but also as citizens. You can’t solve these problems just on campus – you have to go off campus. Large special interests that we are taking on to solve these problems are off campus – the textbooks industry, oil and coal lobby. If students have any chance of being able to take on these powerful interests we need a voice where decisions are make – in Sacramento and DC. This is where our staff comes in. While students can’t be in Sacramento and DC every day working on our campaigns, our staff can. How does CALPIRG choose its issues? CALPIRG is run by an all student board of directors who decides which campaigns to work on and which issues to prioritize. Any student can bring campaign ideas to the statewide board. The student board makes it’s decisions based on which campaigns fit within CALPIRG’s mission, which is to fight for the public interest and to provide the greatest good for the greatest number of people over the longest period of time. Who runs CALPIRG? We are 100% funded and directed by a student board of directors, made up of students from campuses across the state. We hire a professional staff of experts to help us manage the organization on a day to day basis. How do I get involved? There are many ways to get involved with CALPIRG. We have an internship program on campus for course credit. Interns take on leadership roles running a part of or a whole campaign for the public interest and learn the skills necessary by working closely with our on-campus staff. If you don’t have time for an internship, there are many ways to volunteer. And if you don’t have time for that, you can help by contributing financially. 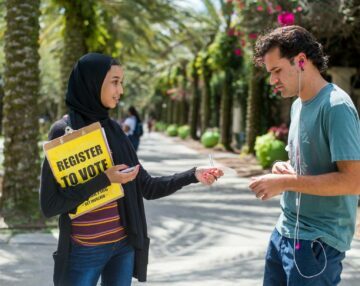 Complete this form if you are interested in getting involved and our organizer on your campus will contact you. How do I contribute financially? If you are a student at a UC campus, you can contribute through the CALPIRG voluntary pledge fee. You can sign up with a CALPIRG representative on campus any term during our pledge drives, which are traditionally in the middle of the term. If you are not a student at UC, you can still contribute through our Donate page. How do I cancel my CALPIRG pledge? Complete this form to cancel your pledge to CALPIRG. Cancellations made before the following dates will be effective the following term, otherwise it will be effective the term after: August 1st for Fall Quarter (or Semester for UC Berkeley), November 1st for Winter Quarter (or Spring Semester for UC Berkeley), February 1st for Spring Quarter. If you have any questions or believe you are eligible for a pledge refund, please contact CALPIRG at (213) 251-3680 x330 or info@calpirgstudents.org.